In this present series we examine a series of films produced by German authors in India. The series identifies these as being useful examples of a ‘visitor-film’. The last article is on Werner Herzog. His films capture the plurality of cultures with an aim to understand them without ascribing value judgements. As he finds out through the Dalai Lama, it is the only way to ensure lasting harmony. Herzog’s lesser known film Jag Mandir, is more an act of meditation than mere documentation. Subtitled The Eccentric Private Theatre of the Maharaja of Udaipur, the film was made at the behest of André Heller, the Austrian artist and performer, who staged performances by nearly two thousand artists. The year 1991 is very significant in India’s economic history; it was when India became a participant in the global neoliberal market. Heller explains in the film that the Maharana of Udaipur, Arvind Singh Mewar requested him to organise the event so that his son could get acquainted with his country’s multifarious art forms before ‘McDonaldization’ takes over. What we then get is the footage from the actual show, coupled with a few segments that were filmed during rehearsals. Not many films in Herzog’s oeuvre are set in his home country, Germany. His nomadic personal life is reflected in works that are filmed on every continent on the planet with a curious eye to marvel at other cultures. In Herzog on Herzog (Farrar, Straus and Giroux, 2003), he mentions his admiration for Joseph Conrad, the Polish-English writer whose work is also imbued with the gaze of the outsider. However, unlike Conrad, in the case of Africa, Herzog refrains from depicting the natives as primitives or savages in his films Cobra Verde( 1987) and Echoes from a Sombre Empire (1990). In a similar vein, his images are free from romanticism or exoticism in Jag Mandir. Once the performance begins, Herzog, like the Maharana and his family, silently looks on without any voiceover. His gaze, much like ours, is transfixed, hypnotized by the contortionists, dancers, and flame throwers. As one looks at a fellow spectator to gauge their response and to assure oneself that they feel the same way as one does, Herzog’s lens briefly turns away from the performance to the Maharana’s young son as he looks on, mouth agape. This is again unaccompanied by Herzog’s narration. By eschewing it, Herzog’s documentary wonders – in the very sense that Greenblatt implied – at the vestiges of a civilization that is on the brink of being lost to Western values, as does the viewer whose sentiments are echoed by the Maharaja’s son. The purpose served is not merely to acquaint the foreign eye with India, but reacquaint the native eye, thus helping us arrive at a deeper understanding of our own arts and our own self:‘to know ourselves better’. The performances in Jag Mandir are preceded by a prayer in front of an intricate work of sand art that the priests took weeks to make. As the prayer ends, the priests wipe the sand art away, an act of immediate detachment with what was painstakingly constructed. This detachment, the sacrificing of moh is a concept central to not only Hinduism but also Buddhism. It is a philosophy that resonates across religions in the subcontinents, as Herzog himself found out a decade later when he made another documentary, Wheel of Time (2003). Wheel of Time is centred on the Kalachakra initiation ceremony wherein Tibetan Buddhist monks are ordained in Bodh Gaya, India, where Gautam Buddha attained enlightenment. The ceremony itself pivots on the creation of the Kalachakra sand mandala, a symbolic map imagining the steps to enlightenment. While Herzog here looks on in wonder, the end result resonates with the viewer. Wheel of Time | © integral-options.blogspot.com An intricate creation, the sand mandala symbolises the realms of consciousness and the world of phenomena. The monks work day in and day out in shifts to complete the Kalachakra and preserve it behind Plexiglas. We see devotees whose thousand-mile barefoot journey is punctuated with full-body prostrations after every few steps. One of them sustained calluses on his hands and forehead after travelling 3,000 miles over the course of three and a half years, but when Herzog focuses his lens on the monk, a profound sense of calm and contentment at having arrived is all that prevails in his eyes. Nearby, other devotees perform one hundred thousand prostrations facing the Bodhi tree, while Herzog captures a child imitating them. The playfulness of his gaze, sometimes sly, also comes across in his interview with the Dalai Lama, who explains that every individual is the centre of the universe. Herzog quips, ‘That makes me feel very good, but my wife won’t be too happy to know that.’ This cheeky remark is not there for mere comic relief; it carries the cynicism of an avowed atheist who, nonetheless, does not manipulate the viewer. The most remarkable aspect of this exchange is that regardless of what Herzog feels about Buddhist mysticism, the film speaks to each viewer differently. The very last monk praying at Bodh Gaya or the sole security officer guarding an almost empty prayer hall, for instance, can either appeal to the audience’s spiritual sensibilities or can make them question the futility of the ceremony. It is also rare in a documentary where the tone is neither interventionist nor expository. Instead, Herzog inadvertently pulls the viewer out of any potentially passive engagement with a gentle swipe of his thumb over the lens of his camera when food rations are thrown at the worshippers. Even in his interview with a Tibetan political prisoner, who was freed after thirty seven years, Herzog refrains from commenting on the situation in Tibet. What he capturesinstead is the unwavering devotion of the former inmate when he first meets the Dalai Lama. 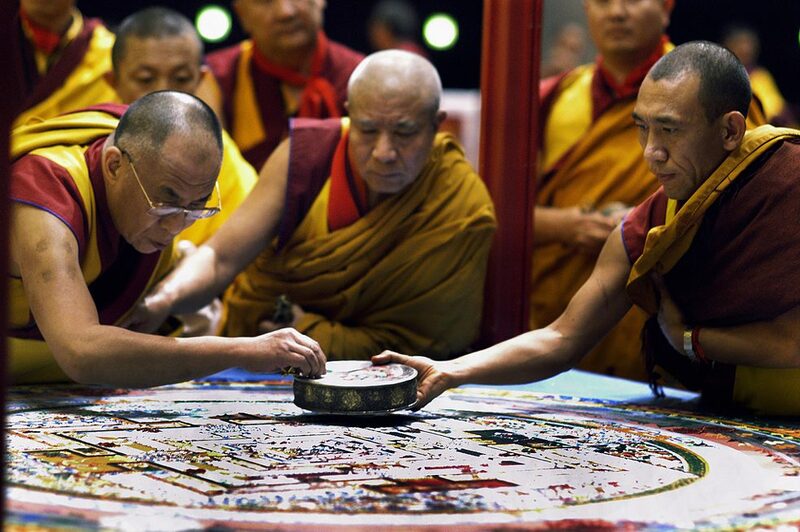 The Kalachakra ceremony in India is hindered by the Dalai Lama’s illness. It is later performed in Graz, Austria where both Eastern and Western devotees gather. Herzog narrates that the Dalai Lama is wary of taking the ceremony to the West and that he ‘recently expressed concerns about believers who change religions and cut themselves off from their cultural milieu. But he does endorse efforts to study and understand other religions. Only in this way can long-lasting peace ever be secured on this planet.’ The Dalai Lama’s words, in a brilliant way, summarize the nature of Herzog’s attempts to document foreign cultures. When the Kalachakra ceremony comes to an end, the sand mandala, like in Jag Mandir, is swiftly swept away and scattered in the river. The scene unites the two films, but where one is awe struck by the cultural and artistic plurality in Jag Mandir, Wheel of Time, with its insistence on transcendence, resonates across religions, both Hinduism and Buddhism, and across Buddhists of different continents. It is not as an ethnographer, but as a chronicler of dreams that Herzog’s work on these two films should be seen: one the one hand, the dream of preserving one’s heritage, and on the other, the dream of attaining inner peace. Collectively, these dreams are unique not only to the subjects of the films, but are common to humanity at large. In this present series, entitled, ‘A Procession of Masks’, writers from Lghtcube, a film collective based out of New Delhi, examine a series of films produced by German authors in India. The series identifies these as being useful examples of a ‘visitor-film’ that perceives the subject of its study through a system of dignity, empathy and curiosity. The four articles contained in the series explore different mechanisms by which to locate value and merit in the films produced by ‘outsiders’ – as also, to look for new ways in which to talk of these titles. The series includes discussions of three primary examples: Werner Herzog’s Jag Mandir (1991), Franz Osten’s Shiraz (1928) and the films of Paul Zils. Sumeet Kaur is a cinephile and editor. She had edited Umbra, a journal of visual culture published by Lightcube. Her film reviews have appeared in The Asian Age.